Superior Share Blog Announcement: Smoking Gun Slot Is Live! Smoking Gun Slot Is Live! We are proud to announce the launch of our new 50-line, 5-reel Slot “Smoking Gun” on all Download and Instant Play, and “Smoking Gun Mobile” on all Mobile platforms! Get ready for a wild west shootout where you’ll help protect the town from a gang of bandits! The icon set includes suit symbols like hearts, spades, diamonds, and clubs. Also included are the Bandit, the Cowgirl, the Outlaw, the Doc, the Sheriff’s badge, hat, and pistol, a horseshoe, and a whiskey bottle. Upon triggering free spins, choose who to have an Old Western Standoff against. 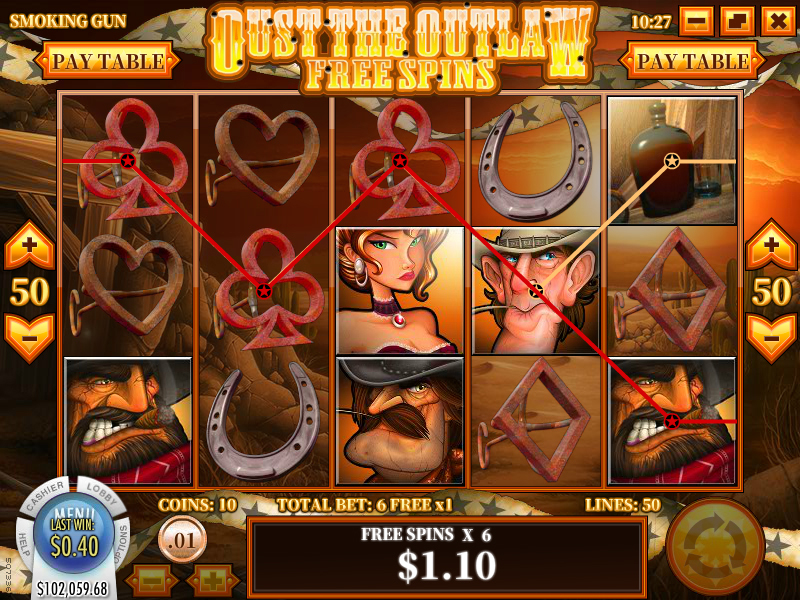 During the “Oust the Outlaw” free spins round, you’ll duel on the reels with one of 3 villains! Smoking Gun Slot is now available at Superior Casino, 24VIP Casino and 888Tiger Casino. Promote this new exciting slot with your audience. If you need custom material, please let us know.